Explanation: The Moon, three planets, and a bright star gathered near the ecliptic plane in the September 18 morning sky over Veszprem Castle, Hungary. In this twilight skyscape, Mercury and Mars still shine close to the eastern horizon, soon to disappear in the glare of the Sun. Regulus, alpha star of the constellation Leo, is the bright point next to a waning crescent Moon, with brilliant Venus near the top of the frame. The beautiful morning conjunction of Moon, planets, and bright star could generally be followed by early morning risers all around planet Earth. But remarkably, the Moon also occulted, or passed directly in front of, Regulus and each of the three planets within 24 hours, all on September 18 UT. Visible from different locations, timing and watching the lunar occultations was much more difficult though, and mostly required viewing in daytime skies. I noticed that Luna looked a little hexagonal while I was sizing it for a wallpaper for my desktop! Beautiful picture though! Best Monday morning drive to work. Right there in front of me, beautifully still. Take a look at Stellarium, a free open source astronomy program available for download for Mac, Windows, and Linux machines. Their web site is http://www.stellarium.org. Is there another star showing in this picture up near Mars? wstchr wrote: Is there another star showing in this picture up near Mars? Sorry, I see three stars in the upper left of the picture NOT near the planets or the moon. If that is Regulus, then the three stars in the top left are probably Leo's head. Gamma Leo and Zeta Leo probably, not sure which name the faint star is. Above-right of Mars, approximately at the 1 o'clock position from Mars and about 50% greater than the Mars to Mercury spacing, is magnitude 3.9 Rho Leonis. You have to look carefully to see it. De58te wrote: If that is Regulus, then the three stars in the top left are probably Leo's head. Gamma Leo and Zeta Leo probably, not sure which name the faint star is. Actually, at the upper-left edge of the frame, Algieba (Gamma Leonis, the fine double star) is on the left, while dimmer 40 Leonis is just below-right of it (they're just above a wisp of a cloud). Farther right, roughly halfway to Venus from Algeiba (but not quite on a straight line), is Eta Leonis. Gamma and Eta are both part of Leo's Sickle, which frames the Lion's head. Perhaps this labeled version of today's image will be more clear than my written descriptions of the locations of the additional stars that have been discussed. Joe Stieber wrote: Above-right of Mars, approximately at the 1 o'clock position from Mars and about 50% greater than the Mars to Mercury spacing, is magnitude 3.9 Rho Leonis. You have to look carefully to see it. Joe Stieber wrote: Perhaps this labeled version of today's image will be more clear than my written descriptions of the locations of the additional stars that have been discussed. I don't see how, from the geometry of this skyscape, the moon occulted Regulus and the 3 planets the day of the photograph. From Venus at the top to Mercury at the bottom I estimate about 19 full moons, or a little over 9 degrees, which is fine, distance and time-wise. BUT, drawing a line from Venus to Mercury, the Moon is NOT ON IT, and is to the side of Regulus. Even if it already occulted Venus and is heading towards Mars and Mercrury, it is NOT occulting Regulus here, and is not on the line. Venus, Regulus and the Moon are forming a right angle. No trajectory sense here. tomatoherd wrote: I don't see how, from the geometry of this skyscape, the moon occulted Regulus and the 3 planets the day of the photograph. From Venus at the top to Mercury at the bottom I estimate about 19 full moons, or a little over 9 degrees, which is fine, distance and time-wise. 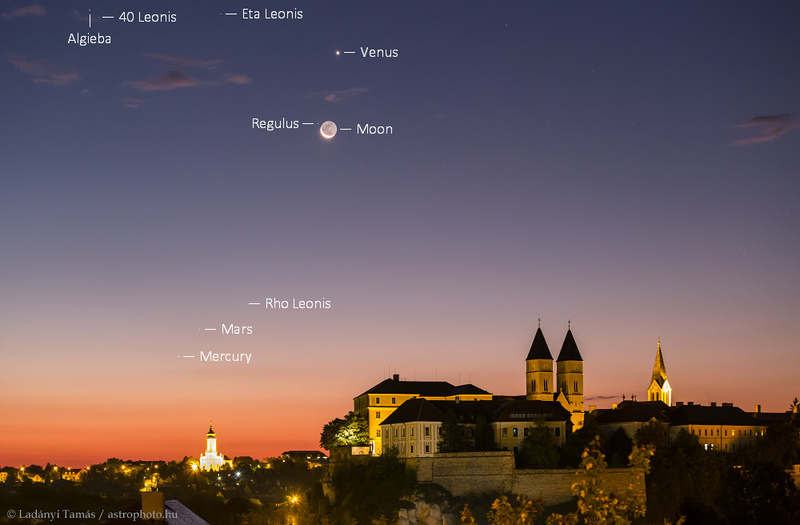 BUT, drawing a line from Venus to Mercury, the Moon is NOT ON IT, and is to the side of Regulus. Even if it already occulted Venus and is heading towards Mars and Mercrury, it is NOT occulting Regulus here, and is not on the line. Venus, Regulus and the Moon are forming a right angle. No trajectory sense here. You're overlooking just how close the Moon is to the Earth compared with the other planets and with the stars. Whether you see an occultation or not depends on where you are on Earth. From the location this image was made, no occultations occurred. In order, they were (1) Venus, seen from SE Asia, Australia, and NZ; (2) Regulus, seen from NE Africa to N Australia; (3) Mars, seen from Micronesia to NW South America; (4) Mercury, seen from E Asia to N Polynesia. I don't think there was any one location where you could witness all of them.